Bourgeois Smokehouse is a brand of Bourgeois Smokehouse, LLC based out of Thibodaux, LA. The business has been around since 2008, started by John Bourgeois. His roots in the meat business goes back to 1895 with his grandfather, who ran a meat market in Louisiana. That was passed down to his son, who then passed it to John. Bourgeois Smokehouse is a separate business from the meat market, specializing in beef jerky and sausage. Bourgeois makes jerky in his own USDA approved facility. This Cajun beef jerky appears to be the only jerky variety Bourgeois offers. He claims its cut from inside round, marinated in his own cajun seasoning blend, and slow smoked over oak wood. Beef, water, salt, red pepper, black pepper, monosodium glutemate, sodium nitrate. The first thing I taste from the surface of these pieces is a light smoky flavor, and a light oily flavor. After several seconds, a light saltiness is detected. Overall, a very light surface flavor. The chewing flavor starts off with a stronger saltiness, a stronger smokiness, but a light natural meat flavor. There's a light spicy tingle in the back of my mouth. As for being billed as a cajun variety, this jerky doesn't necessarily give me that sense. I do pick a light spiciness in the background, but it doesn't dominate the overall flavor. The saltiness is more dominant, and it seems like I taste that more than cajun seasonings. There's a light bit of heat/burn in this; I'd rate it about a mild-medium on my hot scale. Could be rated as medium for the general populace. The smokiness is very pronounced in the chewing flavor. This oak smoked jerky definitely has a unique flavor, one that I haven't encountered in the usual assortment of hickory and mesquite smoked brands. It reminds me more of the smoke I taste roasting weenies over a campfire. The natural meat flavors are light, but still noticeable. Overall, the saltiness seems to provide the dominant flavor of this jerky, being at a high intensity, perhaps still just enough for me to tolerate. The smokiness is also a dominant flavor. The natural meat flavors are light enough to where they only color the salt and smoky flavors. And that's really about all I taste in this. These are strips of whole meat, cut into lengths of 4-7 inches, and cut thick. 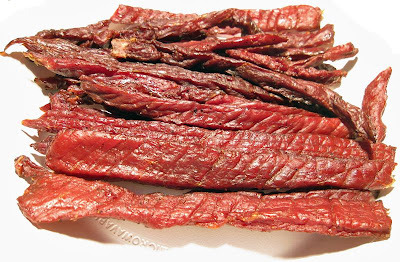 It's a semi-moist jerky, one that easily breaks apart with only a slight bit of bending. For that matter, it's very easy to bite off chunks. It's also easy to chew, some strips being quite soft and tender. The chewing texture starts off feeling stiff, but easily falls apart with light biting. Some pieces are rather brittle, while others are soft. They chew down to a soft mass with about 15 seconds of chewing. But at that point, the brittle strips seem to feel crumbly more than anything else, while the soft strips feel mushy. Neither take on a steak-like texture. They still have a fibrous texture, but they don't mesh together like a well cooked steak would do. These strips seem very lean, as I didn't find any chunks or streaks of fat, no gristle or tendon, no stringy sinews or anything unchewable. In terms of clean eating, these strips have a light oily film on the surface that picks up on my fingers. Otherwise, it's fairly clean eating. 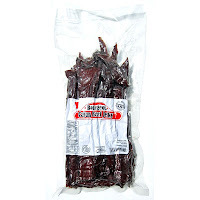 Bourgeois Smokehouse sells this Cajun beef jerky from their website at a price of $11.00 for an 8oz package. Add to that shipping costs of $10.09, and it comes to a total of $21.09. That works out to a per ounce price of $2.64. 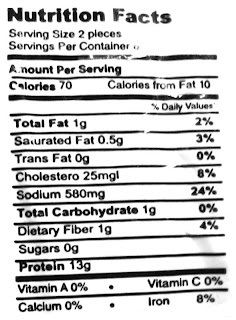 For general jerky snacking purposes, at the $2.64 price per ounce, it's a weak value. I'm getting only a low level of snackability, largely due to its high saltiness, low flavor complexity, and crumbly or mushy chewing texture. Only the strong smokiness and easy eating creates what snackability I get. Thus for that matter, $2.64 per ounce is just too high for what value I get back. On the other hand, if you can buy this at a store without having to pay the shipping, it's a decent value. As a Cajun variety of beef jerky, at the same $2.64 price per ounce, it's poor value. I just don't get any sense of cajun style flavoring from this. I'm not exactly sure what defines a "cajun" style flavor, but this jerky still comes off as being just salty & smoky, with little else. 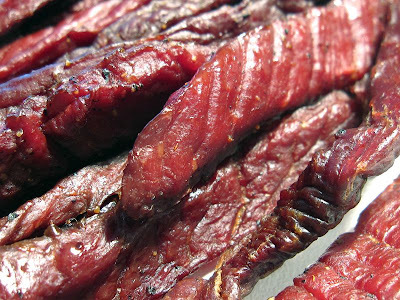 This Cajun beef jerky from Bourgeois Smokehouse provides a good deal of smoky flavor, and is rather easy to chew, but that's about where the positives end. The oak smoke flavor is a nice flavor I think, resembling something very much like the smokiness you get roasting weenies over a campfire. But the flavor is rather simple, being mostly just salty and smoky. I do get a light natural meat flavor, but its overwhelmed by the saltiness. I don't really perceive this as having any kind of cajun flavoring. I do pick up a light spicy burn, but nothing else in terms of cajun flavor. And then the chewing texture doesn't feel like a real piece of meat. It's crumbly with the more brittle pieces, and mushy with the more soft. For my recommended beer pairing, I'd go with a light bodied, lightly flavored, cream ale, to counter the saltiness, and help accentuate the smokiness.